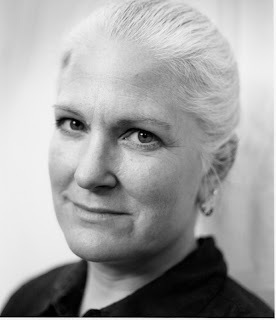 Today, we spoke with Joyce Degenfelder, who makes wigs for Seattle Opera and Pacific Northwest Ballet. Jon Dean: Joyce, you've been the principal wigmaker at Seattle Opera since we moved into McCaw Hall with Parsifal in 2003. But your history with the company goes back all the way to The Ballad of Baby Doe in 1984. Tell us about how you got into this business in the first place. How does one become a wigmaker? Joyce Degenfelder: I stumbled into doing wigs when I was in college, working at a summer theater. The guy they usually had do their wigs was in Europe one summer, so I ran shows for him. It was a long time ago...but I still work with some of those same actors in Seattle nowadays! In terms of getting into the business, though, I've worked with a couple of people repeatedly who are still here in town. There are colleges with training programs in wigs and makeup, and of course we have interns. Jon Dean: Tell us about the process of making wigs. Where do you get the hair? How long does it take to make a complete wig? Can you reuse wigs, from show to show? Joyce Degenfelder: The standard used to be European hair, it came straight, wavy and corkscrew textures. Now the majority of hair for wigs comes from Asia and Indonesia. The options for textures has expanded as well as wild colors to buy. In the theatre and opera, you can buy an existing wig and augment or rework it, or build one completely from scratch. That involves making a base, tying the knots, and mixing the hair color (that's the part I really enjoy!). It's generally better to make it from scratch, custom-made for one particular singer in one particular opera. But that takes forty to fifty hours, so I don't do it as often as I'd like! And yes, I reuse wigs all the time, especially when you're working with the same performers. The chorus, you know, sometimes they say "Can I have the wig I had last season in such-and-such an opera?" Jon Dean: When the performers show up in town for the first day of rehearsal, they immediately go in for a wig fitting. How does that work? Joyce Degenfelder: Wigs are extremely personal, and the fitting is really to make sure that the performer and I get their ideas incorporated also. By that point (theoretically!) the costume designer and director and I already have a plan of where we're going, but the performer needs to be part of that discussion. I also measure their head. If I think I need to make a custom wig, I make a lovely Saran Wrap and Scotch Tape mold of their hairline to take with me! Jon Dean: Does a performer's own hair color and complexion affect the choice of wig you give them? Joyce Degenfelder: All the time! In Le nozze di Figaro, for instance, we had talked about a blond wig for Barbarina; but Leena Chopra showed up, she's a gorgeous olive-skinned, dark-haired girl with Indian parents and her own hair quality is fabulous, so we decided she'd use her own hair. And for Dr. Bartolo, initially we thought Arthur Woodley would wear a white wig, but it doesn't work with his dark skin color. 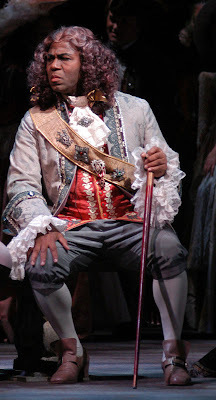 So we'll give him a softer-looking dark grey period-type wig, made of coarse yak hair, similar to the one he wore as Geronte di Ravoir in Manon Lescaut a few years ago (right). Jon Dean: How many wigs are you making for Le nozze di Figaro? Which ones will require the most care? Joyce Degenfelder: Figaro will have 22 or 24 wigs. It's a very physical opera, so the wigs will require daily maintenance and at intermission. The Count probably has the most complicated hair--we're going to move him from being in his dressing-gown with his hair down, in Act One, to getting more and more tidy and better-dressed over the course of the day. Jon Dean: Who's your favorite character in this opera? Joyce Degenfelder: Oh, it's hard to say. I like working on Susanna and the Countess, it's fun to try to make them a little bit different but both still very feminine. And Ted Schmitz, who plays both Basilio and Curzio, as Curzio (the judge) he has a yellowey-white yak hair wig, and as Basilio he's got a powdered ash-brown gray wig. I love all the various challenges that come with working in opera, be it a show where there's 160 wigs, or period pieces like this one...it's fun to dive in and try to get it right! Utilize cozy or perhaps great h2o any time looking after nice hair wigs for African American women. Needed clip hair extensions. Worked with Zala tape hair extensions that was very friendly, helpful and knew exactly what was needed. I tried on a number of things and decided to order a piece in exactly my color. I ordered my color which should be in next week and am looking forward to seeing it. Very nice….